Can You Spot the Real Chinese Apple Shop? 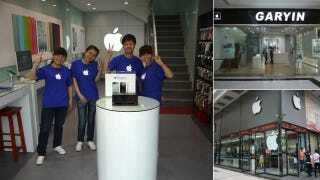 In China, there are honest-to-goodness Apple Stores. There are also authorized Apple resellers. But there are also many unauthorized ones. Of course, official Apple Stores in big Chinese cities like Beijing look like official Apple Stores anywhere in the world. The authorized resellers, however, are easier to fake, which is why they've popped up all over the country. All you need are a big Apple sign and some employees in Apple shirts. So, how do you pick out the authorized ones from the unauthorized ones? As website Isidor's Fugue pointed out, you can check Apple's online list of authorized resellers. That is probably the easiest—and most reliable. However, if you haven't checked Apple's online list of authorized retailers and you see a store with "Authorised Reseller" on it, how do you know it's the real deal? According to Isidor's Fugue, one way to judge is the reseller's authenticity is to note how the Apple logo and name is used. Often authorized Apple resellers will not plaster the Apple logo all over their store sign. Moreover, they will have a very clear, non-Apple store moniker. For example, in the above gallery, the retailer "Garyin" is an authorized Apple reseller. Now you know!